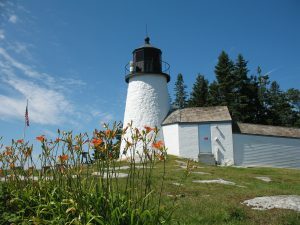 If you have ever done any research on Maine or have ever been here, you will know that one of the most popular attractions we have here in our state is our lighthouses. For generations, lighthouses have been used in one way or another. In their first years, it was to help guide ships into our rocky harbors. While life and technology have moved on to where we are now, lighthouses are still a very useful thing. We at Topside Inn have one lighthouse in mind that makes a perfect afternoon trip here in Boothbay Harbor, the Burnt Island Lighthouse. Come see how you can learn so much about the history of our area from just one trip. As with all lighthouses, they are close to the sea. Here in Boothbay Harbor, you may know that we have many fun islands that are located close to the mainland of Maine and one of them is Burnt Island. This one is just a mile off shore and when you ride out there, you will get a lovely harbor ride as well. 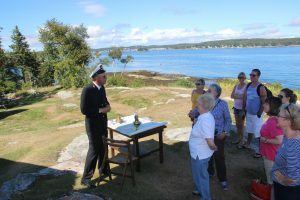 Our friends at Balmy Days Cruises have a great Burnt Island Lighthouse tour package. They will take you out to the island and back on a quick 15-minute trip. While on your way out and back you will be able to take in the views of the harbor and the local animals that live there as well. The first thing to do on Burnt Island is to visit the lighthouse. While you may have seen many lighthouses in your time, nothing beats the Burnt Island Lighthouse, especially for those of you who love history. At many other lighthouses, you may get a chance to see it, maybe climb it and there might be a museum with some of the history behind it. At the Burnt Island Lighthouse you get a chance to see, hear, touch, and understand the life of the keepers through living history. Living history is an amazing thing where people portray these historical figures and give you a close up look at their life. Join keepers Joesph and Annie Muise as they recall their life in the 1950’s here in Boothbay Harbor. Ask questions about their life and how life was in the 50’s. When you are done, have a look inside the lighthouse, climb the stairs and peer out over the harbor. Besides, visit the Burnt Island Lighthouse, one of the things you can do is to walk around the island. It is about 5 acres so it should be an easy and enjoyable walk. Be sure to bring your camera to take pictures of not only the lighthouse but the surrounding harbor as well. This is a vantage point that many don’t get. A walk will also get you acquainted with the local flora and fauna that make Burnt Island their home. The historic Burnt Island Lighthouse will be celebrating its 200th anniversary in 2021! However, leading up to this event, the lighthouse needs your help to undergo a major restoration of the tower, lantern room, keeper’s dwelling and the education center. You can help support the preservation of this historic landmark by making a donation to the Keepers of the Burnt Island Light organization or by spreading awareness through friends and family. As you can see, there are so many ways to not only enjoy Maine but learn so much about it too. The next time you think about coming to Boothbay Harbor, consider staying with us at Topside Inn. Our beautiful B&B is not only convenient to town, and a host of restaurants and activities, but can also give you some of the most gorgeous harbor views in town. Our B&B has ample space with not only it’s 3 buildings but a separate cottage as well for those who enjoy their privacy. Each morning, join us for breakfast before you head out for the day. Contact us today and begin planning your next trip to Boothbay Harbor! Want to learn more about our area? Request our free Vacation Guide today!